I've had it. Who knew I could get the same sleep-deprivation from my cat as I had when my babies were tiny. Who knew?! We've given our dear, old cat Maddy a lot of attention and care since her sister Phoebe passed ("A Sister Stands Vigil"). It wasn't an easy time for any of us and it's been so nice to have a cat that takes all of our attention in stride. Phoebe wasn't as patient with being picked up and loved as Maddy, so she's getting even more affection now. However, I'm getting a bit crazed with sleep-deprivation because Maddy is requesting attention at all hours of the day - and night! She's singing her song of "Get me some fresh water in my dish, now!" starting anywhere from 3am to 4am. She's creating a strange bellowing sound in the early morning hours to request more food. (She eats wet food and prefers the "extra gravy" kind.) I can't believe how demanding she's become! We've bought her a bigger water dish and I've started putting her dinner out later at night with the plan that this move will tide her over until we are woken up by the alarm clock, NOT her bizarre meowing. Her sound is a cross between a cat trying to sound like a cow trying to sound like a fire alarm. It's not pretty. So today I begin my latest ploy. When ever I see her resting/sleeping I'm going to be sure to pet her, love her, pick her up. Let's make sure she doesn't get as much sleep during the day as she's been getting so hopefully she'll sleep through the night. Do they make Binky's for cats? 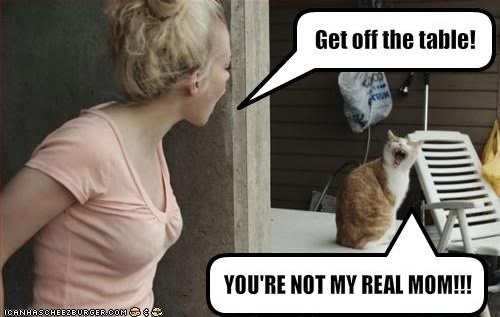 If you are a cat owner, have you ever had this experience? What did you do?